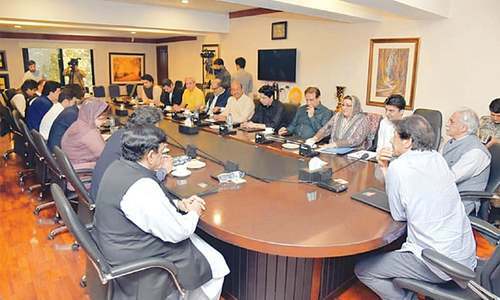 ISLAMABAD: Infor­mation Minister Fawad Chaudhry on Wednesday sparked a new controversy by announcing that a “unified” regulatory body for all media, including social media, would be formed. A similar move was made in September last year by a few officers of the information ministry who had floated the idea of reintroducing regulations of the 1960s aimed at controlling the press. The move was opposed even by the government and action was initiated against the officers concerned. But the information minister has now resurrected the proposal soon after assuming his office. Speaking to journalists outside the Parliament House, Mr Chaudhry said the role of the Pakistan Elec­tronic Media Regula­tory Authority (Pemra) and the Press Council of Pakis­tan (PCP) had been review­ed and it had been decided that all the regulatory authorities would be merged into one body — called the Pakistan Media Regulatory Authority. Interestingly, the minister said the government had reached its decision after consultation on the issues involved with some “friends in the media”. “After consultation with our friends in the media the government has decided to do away with Pemra and PCP and constitute a new body which will not only look after electronic media but also print and cyber media, which is commonly known as social media,” Mr Chaudhary said. The new body would have representatives from the media as well, the minister said. Because the new body would save resources, the proposal would benefit the country. He then referred to the Supreme Court’s remarks during a hearing about media’s code of ethics and said: “In the coming days you will see major changes in the information ministry, regulatory bodies and Pakistan Television,” Mr Chaudhry said. Representative bodies of journalists and other media workers took the ministry’s plans seriously and the Rawalpindi Islamabad Union of Journalists (RIUJ) resolved to defend their rights against the government’s alleged move to curtail freedom of the media. Former information minister Marriyum Aurangzeb also criticised Mr Chaudhry’s statement and said her party would resist all moves to curtail media freedom. “Also, the structure of Pemra can only be amended through an act of parliament,” she said. “The information minister should study the laws before making controversial announcements,” she added.